It’s as if Zeman has no further obligation to have anything to do with that Warsaw Pact “brotherly assistance” simply because of how he is alleged to have behaved in the years immediately afterwards. Let’s take a quick look at what that behavior actually was; for this, I go to his page in the Czech Wikipedia. I know, the particular nature of that source is such that you never can discount someone with a political point to prove distorting what you find there, but still, there’s some interesting material. Spokesman Ovčáček in his answers claimed Zeman was fired no less than three times for his opposition to the ’68 Invasion. The Wikipedia page – as I say, FWIW – has no explicit mention of any of these; rather, it says Zeman joined the Czechoslovak Communist Party in 1968 (when he was 23) and then was expelled in 1970 for his anti-Invasion views. Was he actually a Communist Party employee during that period? The article does not say, although it hints he was staying on then as some sort of instructor at the Prague Economics University, from where he had just graduated. After experiencing that, it seems Zeman went on, up through 1989, to occupy a series of jobs all having to do with running economic models. Interestingly, the first such, lasting until 1984, was at Sportpropag, a company normally having to do with athletics and physical fitness for the masses – but, apparently, under the Communist system such a firm could also have its own department devoted to complex economic models. The article also gives a few details (too few) about some sort of cooperation, with the economics analytical sense, for the State Security department in the early 1980s. Then in August 1989, before the Velvet Revolution happened, Zeman dared to have published an article he had been nursing for years which criticized the Communist economic system. He was promptly fired from his position at another company doing economic models – but, of course, three months later the entire world in that part of Europe turned completely upside-down. Not without reason, this program [the State Economic Research Programme, begun in the 1980s and the umbrella organization for the sort of economic bureaus in which Zeman worked] was said to provide a livelihood to many politically suspected intellectuals. This department [Zeman’s own “Department of Comprehensive Modelling” within Sportpropag] was disbanded in the spring of 1984, for political reasons. It had published an anthology on the methodology of social sciences, which was openly critical of the condition and state of the pro-regime Czechoslovak science [sic]. OK then, it was an earlier bit of published dissent which seems to have led to his job-switch around 1984. In some sense, then, Zeman did refuse – on occasion – to just play along with the authorities and paid for that in some way. Most Czechoslovak citizens, truly, hardly went that far – they just dug in to the gravy-train, so to speak. But a few did do much more. Again, though, Miloš Zeman is the Czech President – and he is running for re-election in the direct election for the post that will occur sometime later this year (or early in 2018). In view of this (minor) controversy, it is timely that a new trove of personal photos of the chaos in Prague during that 1968 Warsaw Pact invasion, taken by a visiting Polish geologist, have just surfaced, and you can see them here. 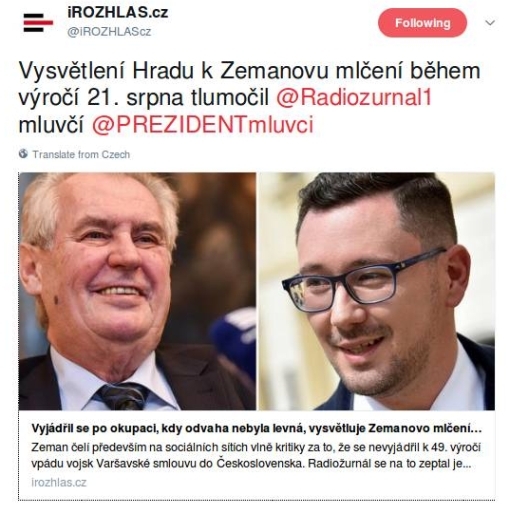 Let me also remind you that it was a reporter from Czech State Radio (Český rozhlas) who question the President’s spokesman about his strange behavior; there is now very good reason to doubt that the same would ever happen in what are supposed to be the Czech Republic’s brother-states in Central Europe, namely Poland and Hungary. Finally, let me add another bit picked up from Zeman’s Czech Wikipedia article, from the section titled “State of Health and Diet”: Zeman reportedly drinks daily six bottles of wine and three “drams” of hard alcohol, in addition to being a heavy smoker. He is a diabetic – and he is also now almost 73 years old. But, again, there was no attempt by his spokesman to excuse on the basis of any health problems his absence from last Monday’s commemorative ceremonies.